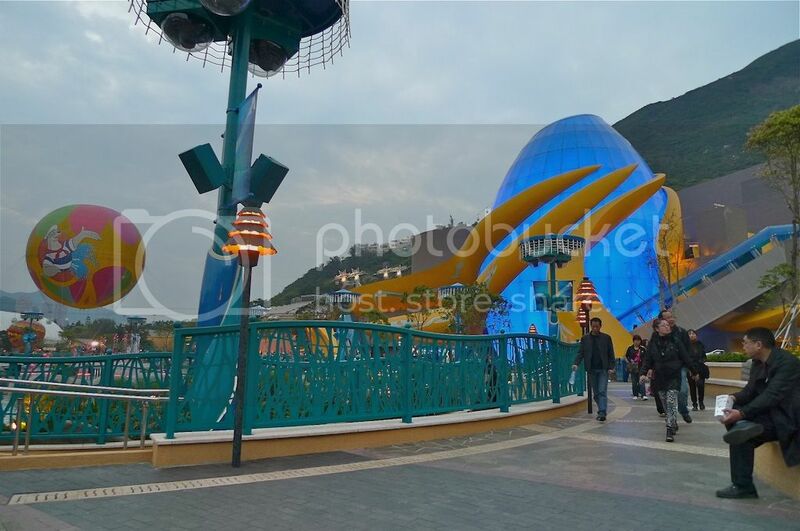 Ocean Park Hong Kong is divided into two main areas - The Waterfront and The Summit. These two areas are separated by a mountain. Visitors can go from one to the other by cable car or by train. My friend and I took the cable car from The Waterfront to The Summit. Read about my 15-minute cable car ride HERE. After visiting the Sea Jelly Spectacular and the Chinese Sturgeon Aquarium at The Summit, we went back down to The Waterfront via the Ocean Express Train. 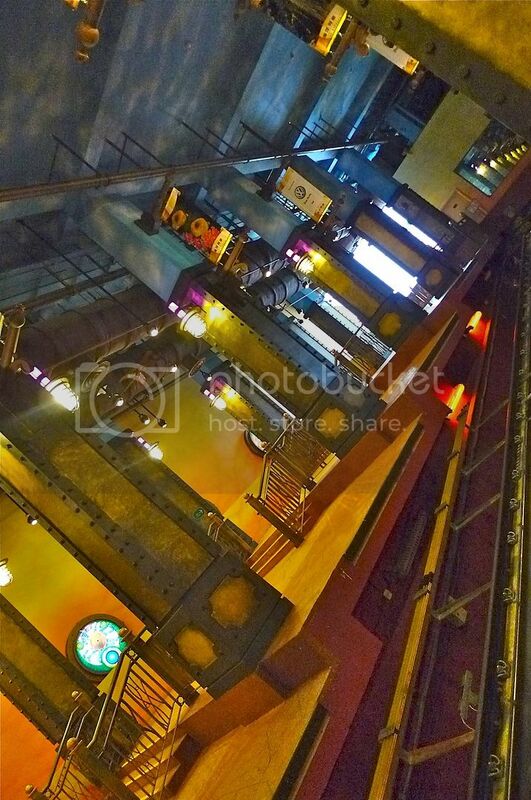 I did not take a picture of the train but I found this picture online. 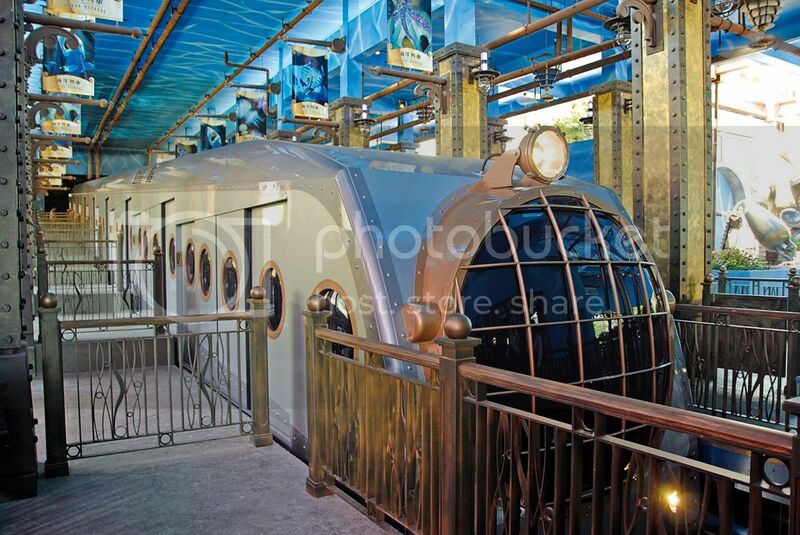 What's unique about this Ocean Express Train is that it actually simulates the feeling of traveling under the sea in a submersible vehicle! When we were inside the train, we were transported to a world beneath the ocean where creatures of the deep swam all around us! This was cleverly done by using hi-tech multimedia technology. At one point, I almost forgot I was traveling inside a train! I though I was really deep in the ocean. Although we reached The Waterfront Station in about 4 minutes, I felt it was much longer than that. If you ever go to Ocean Park, do not miss this train ride! Once we were back at the Waterfront, we went around looking for food. 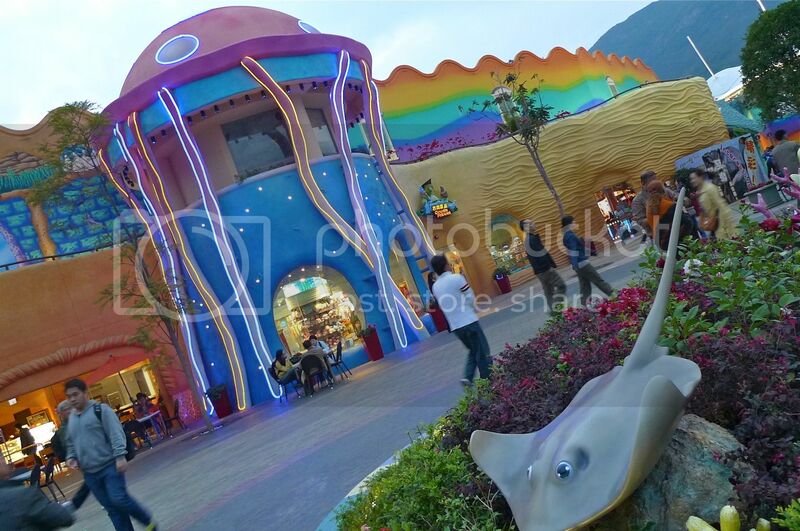 The above picture shows the Grand Aquarium which we visited earlier in the day. You can read about it HERE. There were a row of shops and cafes facing the Aqua City Lagoon, where we were going to watch the Symbio water screen show later at night. 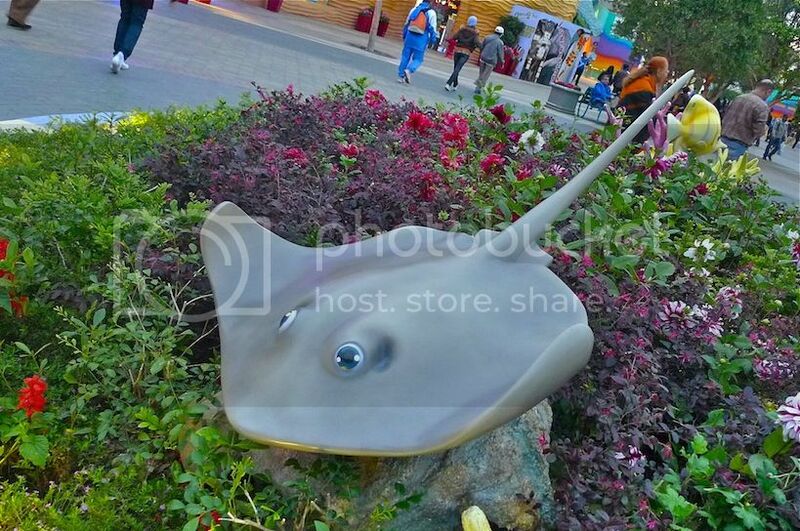 I love the colourful building and the cute stingray! 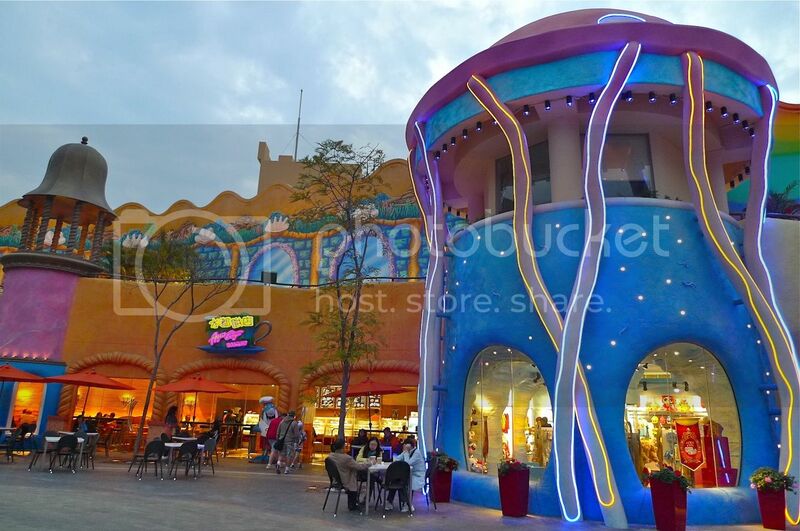 Next to the blue colour building is the Aqua City Bakery. We went in there for some quick bites. 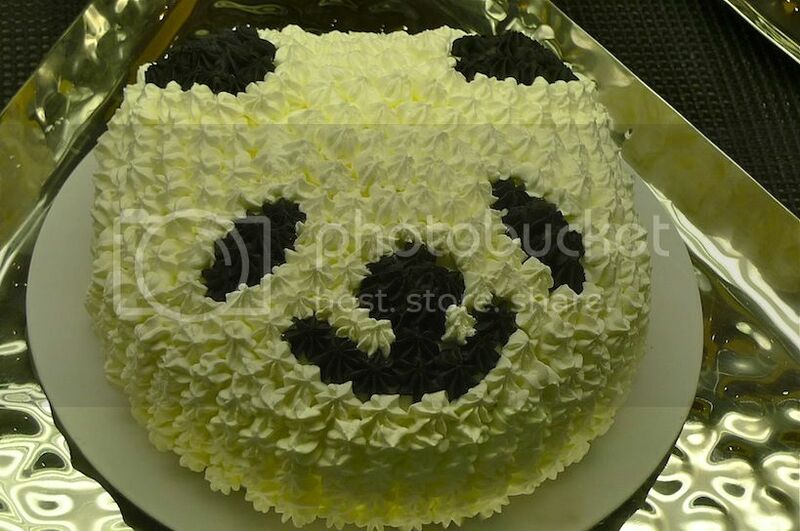 It was in this bakery that I saw the panda cake I told you about in an earlier post! No, we did not eat this panda cake but we ate some light snacks (sorry no photos) as we wanted to have a good dinner somewhere outside of Ocean Park later in the night. Most of the food here were super expensive and not worth the money! After our light snacks, we walked over to another row of shops opposite, also facing the Aqua City Lagoon. 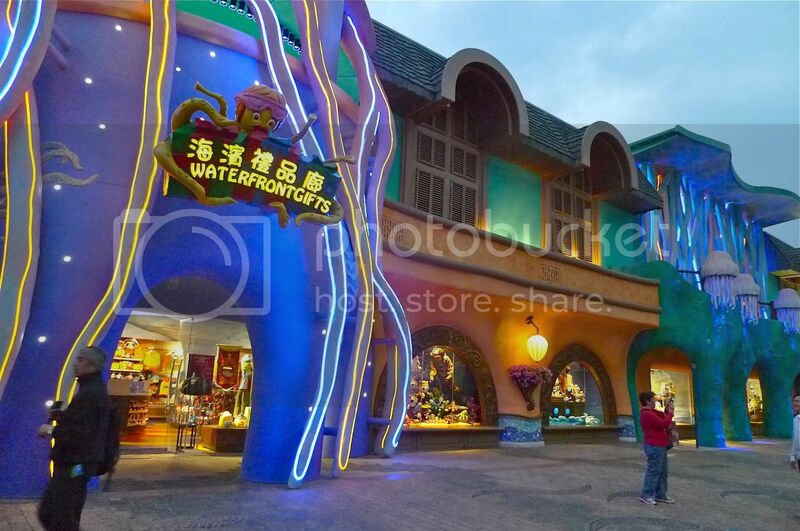 This Waterfront Gifts shop sells lots of souvenirs! 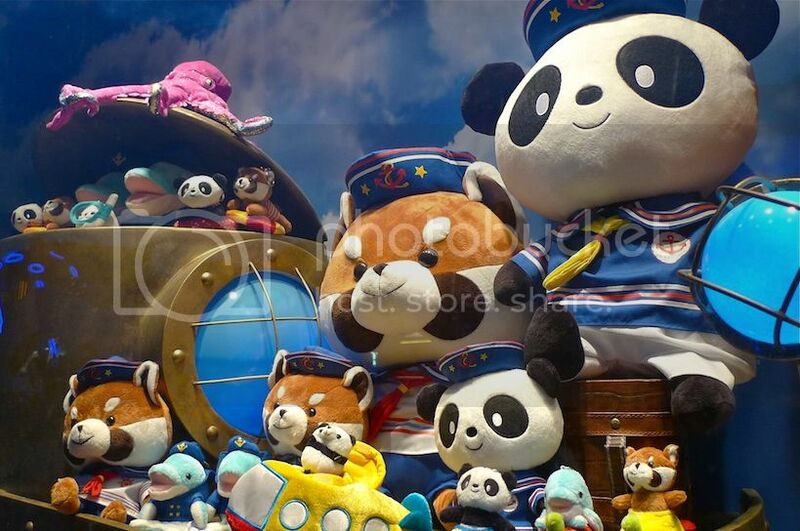 Lots of my favourite panda plushies, big and small! Soon it was time for the show to begin. 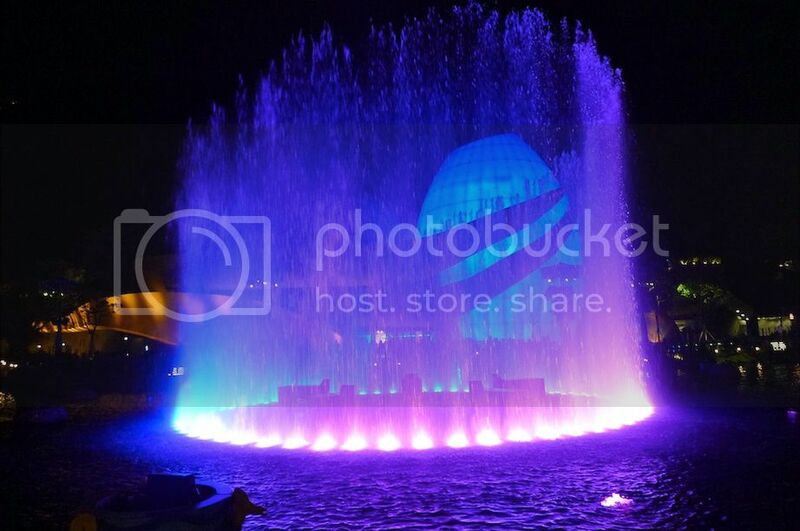 My friend and I tried to find a good place around the Aqua City Lagoon where we can have a good view of the water screen show. By then, many people were already there waiting. 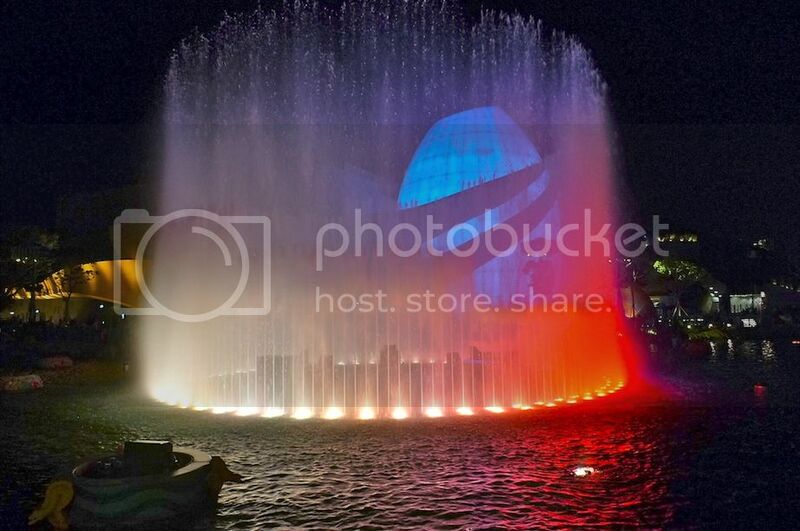 Before the show started, we were entertained by the dancing water fountains. 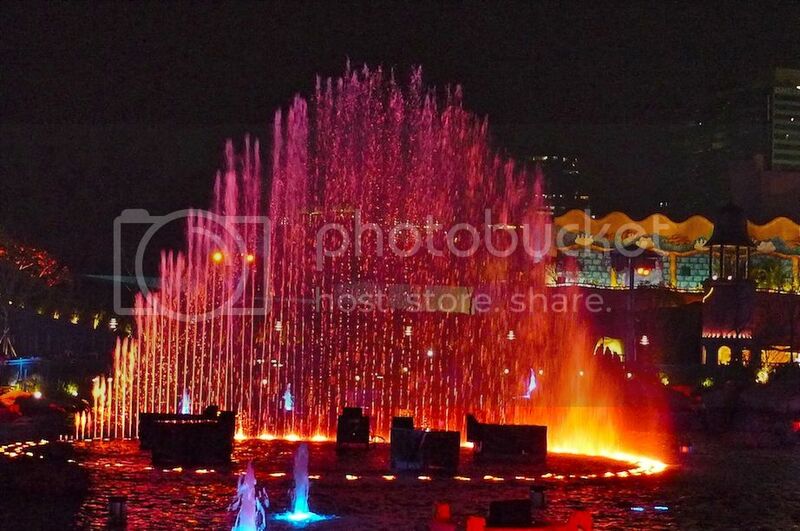 The fountain of water changed colour every few seconds. It was a feast on the eyes! Can you see the Grand Aquarium in the background? We found that we were too near the fountain as the water kept splashing at us. I was worried for my camera so we decided to move to a safer location. The 360 degrees water screen show called Symbio is a world's first featuring two 9-metres tall fiery dragons fighting each other. The show which tells the story about the unions between humans, Earth and the need to protect our planet, is a mixture of hi-tech pyrotechnics, music and animation. I managed to record part of the show on my iPhone although it was not very clear. Watch it below. When the dragons hurled the fire across the water, I could feel the heat! It was almost as if we could touch the burning fire! Needless to say, the show was enjoyable from the beginning right to the end! Just like the fireworks show at Disneyland, this Symbio show is a must-watch at Ocean Park. It is shown daily at 7.30pm. 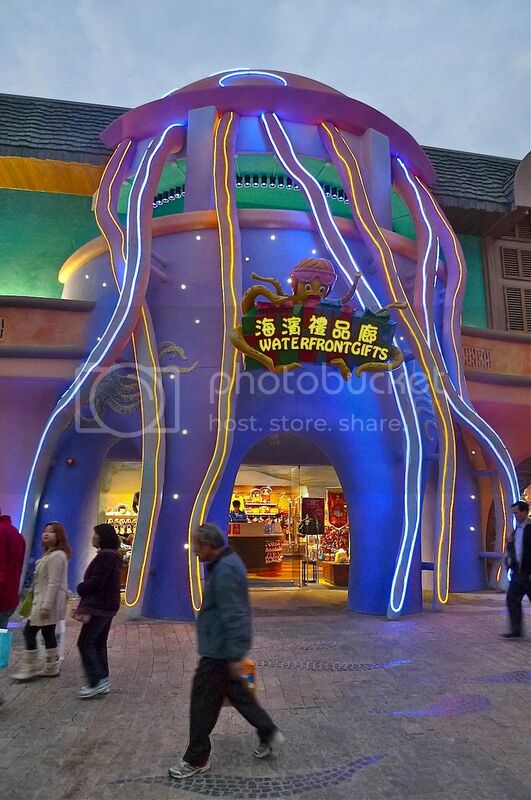 The show certainly served as a fitting end to my visit to this most entertaining Ocean Park in Hong Kong! 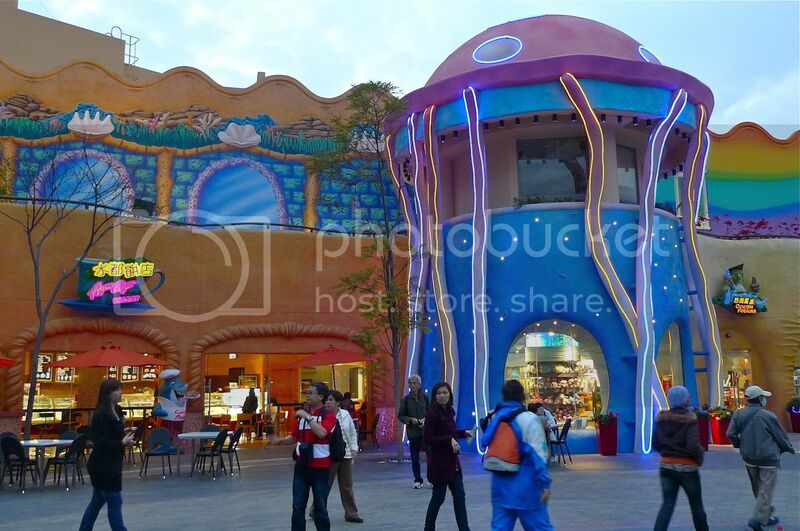 Now for the million dollar question : Will I ever return to Ocean Park in the future? You bet!